How to insert the output of a table-valued function in a SQL table. How to insert the output of a table-valued function which is created on the remote database server. Insert new records in a table (Basic Insert). Insert values of a specific column in a table. Insert the output generated by a stored procedure in a SQL table. <value FOR COLUMN 1 >.. Execute the “Select” query against“Student” to review the results. To insert values in specific columns of a table, you need to provide the name of the target table and name of the columns in which you want to insert data. The following is the syntax. Execute the “Select” query against the “Students” table. 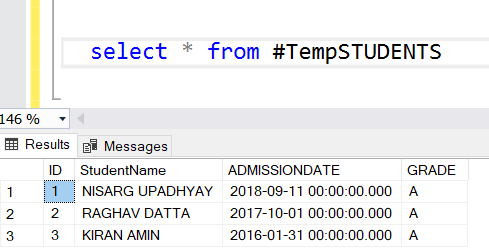 Once the table is created, execute the following code to insert the output of “spGet_Student_Admissiondate” to “#TempStudents”. Now, as I mentioned above, I am going to demonstrate how can we insert an output generated by a table-valued function in a SQL Table. Firstly, let’s understand what is a table-valued function. It can be executed within the Select query. It can be used in multiple parts of a query, e.g.g in the Case statement, where/having clauses. The output of a table-valued function is a recordset, hence you can join the function with tables. In this section, I am going to explain how to insert the output of a table-valued function in a SQL table using T-SQL. For demonstration, I am using the AdventureWorks2014 database. I created an inline multi-valued table function named “GetEmployeesbyHireDate.” This function populates information of employees, hired within a specific date and time. The function uses the @FormDate and @Todate parameters to filter the data. The output of the function will be stored in a SQL Table. Now, create a table named “tblEmployee” to store the output of the “GetEmployeesbyHiredate” function. The following code creates the table named “tblEmployee”. Sometimes, you may want to extract data from the servers stored in a different data center. This can be done using SQL Linked server. In this section, I will explain how to insert the output of the table valued function, created on the remote server. Now to demonstrate the scenario, the following is the setup. On the source server (SQL_VM_1), create a table-valued function named “getCustomerByCountry” on the “AdventureWorks2014” database to populate the data. On the destination server, create a linked server named “Remote_Server” to execute the function (getCustomerByCountry). On the destination server, create a table, named “Customer” to store data, retrieved by the remote function (getCustomerByCountry). The following image illustrates the setup. On the source server (SQL_VM_1), create a function named “getCustomerByCountry.” It populates details of a customer located in a specific country or region. The function uses the @CountryName parameter to filter the data. Execute the following code to create the function. To populate data from the source server (SQL_VM_1), first, create a linked server between the source (SQL_VM_1) and destination (SQL_VM_2). Execute the following code on the destination server (SQL_VM_2) to create a linked server. 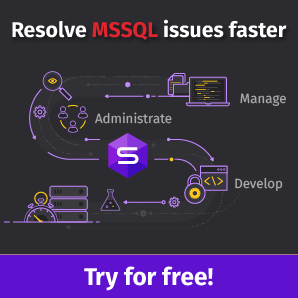 Once the linked server is created, create a SQL table to store the information of customers, and populate it by executing the SQL function, created on the source server (SQL_VM_1). Execute the following code to create a table. Msg 4122, Level 16, State 1, Line 28 Remote table-valued function calls are not allowed. Hence to execute any function on the remote server, we need to use the OPENQUERY keyword. It is used to initialize the ad hoc distributed query using a linked server. Refer this article to understand the concept of OPENQUERY. To use OPENQUERY, we need to enable advanced configuration parameter named “Ad Hoc Distributed Queries” on the source and destination servers. Execute the following code to enable it. Now I want to populate the list of customers, located in the United Kingdom and insert them in the “Customers” table. As I mentioned, the function accepts country name to filter the records. 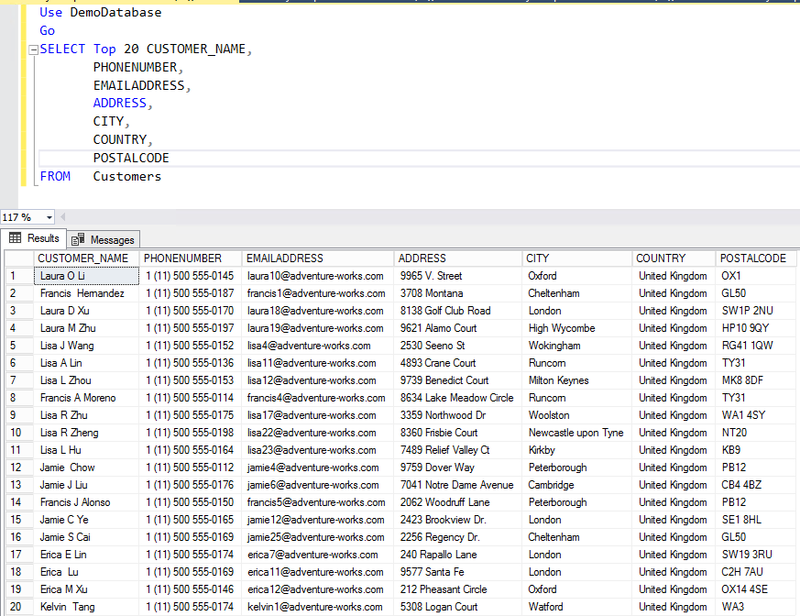 Now, we need to execute the following script on the Destination server (SQL_VM_2) to populate the list of customers located in “United Kingdom”. Now, to insert data populated by in “Customers” table, execute the following script on the destination server (SQL_VM_2). Now let’s verify whether data has been inserted properly. To check, execute the following query on the Destination server (SQL_VM_2). “Insert Into” statement and its usage. How to save the output of the table-valued function in a SQL table. How to save the output of the table-valued function to the SQL table located on remote server using Linked Server.